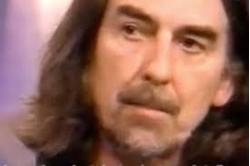 George Harrison's Last TV Appearance Becomes an Eerie Meditation on Dying. Beatles Radio: The Beatles, Solos, Covers, Birthdays, News The Fab 4 and More! When George Harrison stopped by to plug a new project for his old friend Ravi Shankar on July 24, 1997, it was almost as if he somehow knew this would be his last TV appearance. Sparked by an intuitive line of questioning by VH1’s John Fugelsang, Harrison turned expansive on his faith and what happens when we die. Most of that, as you’d expect, was initially left on the cutting-room floor, as VH1 chose to focus instead on the musical portion of their conversation. Harrison was diagnosed with throat cancer later that year, and during the period before he died, the network reedited the former Beatles star’s segment to include his meditation on death. VH1 then aired the expanded version on the day Harrison died, finally giving full voice to a remarkably deep conversation on the nature of death and salvation. Song performances included “Any Road,” a previously unheard number that later appeared on 2002’s Brainwashed; “If You Belonged to Me,” from the Traveling Wilburys‘ 1990 album, Vol. 3; and, most touchingly, the title track from All Things Must Pass. How Harrison got there was pure happenstance. When he showed up unannounced with Shankar, he agreed to answer a couple of questions. “George had just produced the Shankar project Chants of India, and they were going to come and give us a little 10-minute sound bite and then take off,” Fugelsang told Chuck Daly in 2013.